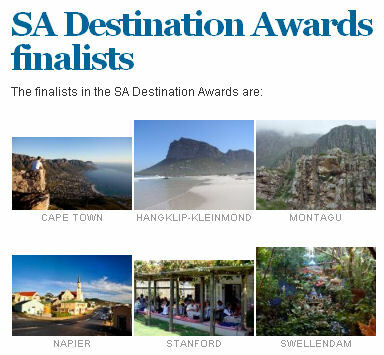 Montagu is in the 'Competition Limelight' again and is a finalist in the South African Destination Awards Competition! To quote CapeInfo: The aim of the competition is to recognise and reward outstanding destinations, both large and small in different categories, and discover & encourage those with potential throughout South Africa. This competition is one with a difference. Entrants could submit preliminary content (information about their towns) and then edit and expand the entry over the period of time afforded them. The competition is about wider, meaningful public participation. It's not just about public or judges' votes. Entrants needed to explain what their destination offers that makes it noteworthy. The public involvement is where the visitors to the destinations - as well as the citizens - can vote for (rate and review) the destination of their choice. The reviews count more than the votes, and reviews or votes from visitors count more than those by locals (who of course want to see their town win!). Click on the photo or name to visit the town's page. After you have registered and logged in, you will see the button to "Add new review". Each review can make the difference. Keep an eye on our Tourism Association's Website: www.montagu-ashton.info as well as the CapeInfo website for further updates in due course!